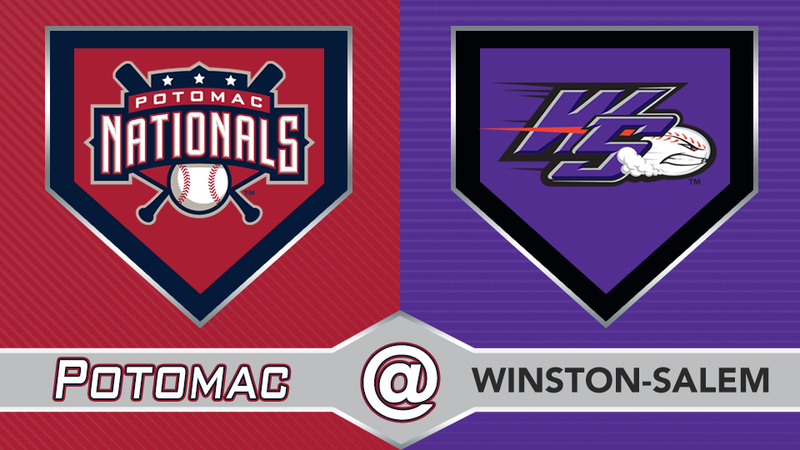 Winston-Salem, NC-The Potomac Nationals (4-5) ended a four-game losing streak on Friday night, using three doubles in a four-run fourth to defeat the Winston-Salem Dash (4-5) by a score of 6-3. Jackson Tetreault (W, 2-0) continued his solid start to the season, picking up the win for 5.0 innings of four-hit, one-run ball. The righty fanned four and used early run support to establish a rhythm. For the second straight night, the P-Nats jumped ahead on the Dash in the first inning. Jack Sundberg led off the game with a single, Cole Freeman followed with a walk, and Telmito Agustin got Potomac on the board with an RBI double off Blake Battenfield (L, 0-1). Aldrem Corredor brought home Freeman with a run-scoring groundout, and Tetreault had a 2-0 lead before he threw a pitch. Winston-Salem pushed a run across in the third inning on Carlos Perez's double and Luis Robert's RBI single. It marked the 15th RBI of the season for Robert, tops in the Carolina League. The P-Nats answered back in the fourth as Osvaldo Abreu catalyzed a four-run inning with a leadoff single. Omar Meregildo , Anderson Franco and Corredor each doubled, with Corredor's two-out two-bagger bringing home two runs to make the score 6-2. AJ Bogucki allowed one run in two innings of work, with only a Perez double and Jameson Fisher RBI single in the seventh on his ledger. Steven Fuentes got the final six outs, allowing a run in the eighth on a pair of walks and a hit batsman but striking out Robert as the tying run to end Winston-Salem's last threat. The P-Nats continue their road trip on Saturday as they send LHP Nick Raquet to the mound against Winston-Salem's LHP Kyle Kubat . First pitch at BB&T Ballpark is set for 6:00pm. The Potomac broadcast will get underway at 5:45pm with the P-Nats Leadoff Show. You can listen to the Potomac broadcast at potomacnationals.com, at http://bit.ly/P-NatsBroadcast, or on the TuneIn Radio App. The Potomac Nationals of the Carolina League play at Northwest Federal Field at Pfitzner Stadium in Woodbridge, Virginia, and are the Carolina League affiliate of the Washington Nationals. The Potomac Nationals have claimed five Carolina League Championship titles (1982, 1989, 2008, 2010, and 2014) and 10 CL Northern Division Championships. Sponsorship opportunities for the P-Nats' 2019 season and beyond are available, as well as all-inclusive corporate picnic outings to watch the future stars of the Washington Nationals at The Pfitz. 2019 Potomac Nationals season tickets and mini plans are now on sale. For more information on Potomac Nationals 2019 season tickets, mini plans, group outings, picnic packages, fundraisers, and all things Red, White, and Blue, visit the P-Nats online at www.potomacnationals.com, follow the P-Nats on Facebook (@PotomacNationals), Twitter (@PNats42), and Instagram (@pnats42), or call the Potomac Nationals' Extreme Custom Collision Ticket Office at 703-590-2311.